Say you have a kid like I do who has mobility challenges and issues with noise, people standing to close to him, bright lights, or changes in routine. The annual school holiday concert can be a real cause for dread and sleepless nights. I calculated that I’ve attended 16 Christmas concerts in my lifetime of being a mom. 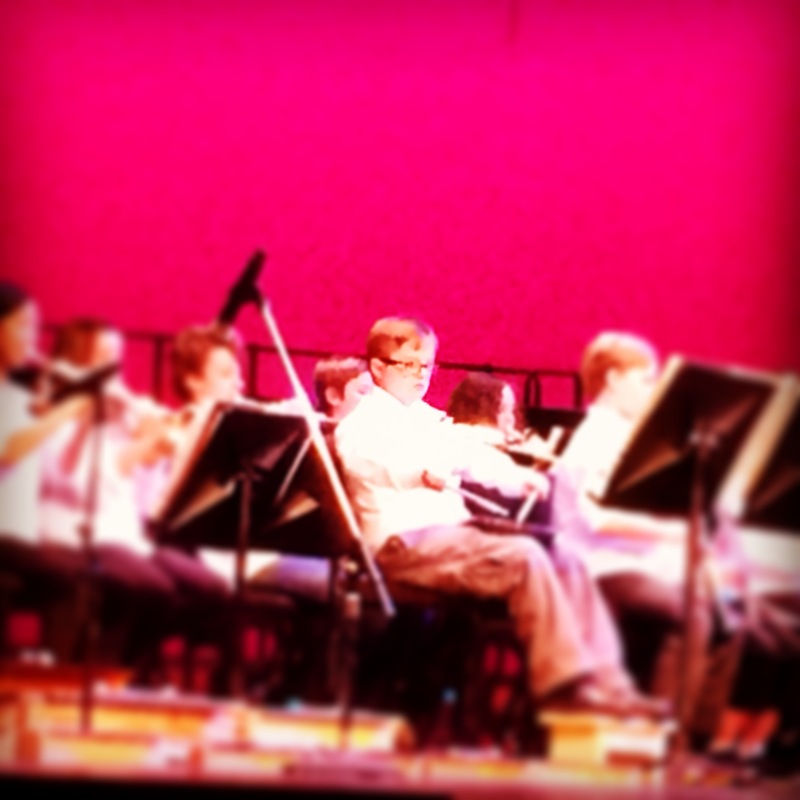 The last seven years I’ve attended our youngest son’s concert. Aaron has Down syndrome, auditory sensitivities and doesn’t appreciate people standing “in his grill.” He struggles with climbing stairs and standing for long periods of time. He also thrives on routine, and does not appreciate changes in his environment. Each year I hold my breath, and trust that the teachers will support him to be a full participant in the concert. This was thankfully true for last night’s concert (see picture). But success does not happen without advance planning from both parents and teachers. When Aaron was in kindergarten to Grade 3, he met the expectation required for the little kids at the school. He climbed up on stage with his classmates, and searched the audience for a familiar face. Then he waved frantically at us, had a hard time standing still, and fidgeted around while occasionally flashing us with his belly as he lifted his shirt up. He stood at the very end of the row of students, and his Educational Assistant was in the wings to redirect him if needed. He fell within the general social expectation for him as a younger kid, and all was ok.
He’s now in Grade Six. Lifting his shirt to show his belly in front of an audience of over 1,000 in his huge school is now not within the social norms for an 11 year old. Now that he’s older, my anxiety level with Christmas concerts has risen. It is super important for educators to recognize how hard the Christmas concert time is for kids. Here are some tips from Aaron’s awesome teachers that have made the past few years of Christmas concert a success for Aaron. Rehearsals to show our kids the venue, or at least share pictures with them. Talking to them to remind them what to expect when they are at the concert. This year, they had the younger grades go first, and then the older grades watched from the balcony (instead of making the older kids stand around backstage, bored stiff). In Grade 4, Aaron struggled with playing the recorder. His little fingers couldn’t reach all the holes, and didn’t have the strength to cover the holes in the instrument. Plus, both blowing and moving his fingers was hard for him. And he quickly got bored, and found it amusing to see what happened when he used the recorder to bop people over the head with it. Oh dear. SO the teachers figured out that he needed another instrument. He chose to play the triangle instead – it was more accessible and a less dangerous instrument for him. Modify and adapt! Last year, Aaron volunteered to do the dance routine, which was pretty complex. Nobody said to him: ‘no you can’t do that.’ Instead, the choreographer they brought in went up on stage and danced right beside Aaron. They danced together so he could follow her dance moves, and so he could fully participate. Sure, he stood on the very edge of the stage, so he wasn’t right in the middle of the dancers, but that was fine. I still tear up thinking about this young lady doing what she had to do so my boy could fully participate in the concert. That, my friends, was an excellent example of a champion supporting inclusion. In Grade 6, they start Band, where the kids have to pick an instrument. This year, his music teacher helped Aaron pick percussion, instead of a brass or horn instrument. Banging on the drums is something he can do. The music teacher modified his drums this way for the concert. I’m ok with this, since I know that hitting a loud instrument at the wrong time would drown out the other students – he got a drum pad and drum sticks to play. The drum pad wasn’t plugged into anything, so didn’t make a lot of noise. I’m assuming Aaron didn’t notice this. He just knew he had an instrument and that he was playing with the rest of his classmates. They also gave him the sheets of music, like everybody else. He dutifully changed the music sheets in between each song, even though he wasn’t really reading the music. I especially loved this last night: although he sat on the edge of the row with the band, (I know his Educational Assistant was in the wings, ready to redirect him if he needed help), he sat with the rest of his class on a chair, but his legs are too short to touch the floor. Having his legs dangle is very distracting to him, and so a grade 8 student built him a little wooden stool so he could put his feet up on it. I think this is an awesome example of community: kids helping other kids out in their school. He very seriously played along with all the songs, and was very pleased with himself afterwards. He had his stool, and his adapted instrument: voila, success! Talk to the music and classroom teachers about what success looks like for your child. Have your kids participate in shopping for the concert clothing, and then practice wearing the new clothing. Aaron complained his button up shirt was ‘itchy’ so I had a spare white shirt in his bag, just in case he insisted on taking off his shirt. (This kid does not like to be itchy). Keep the time before the concert low stress. Have a leisurely dinner, leave early so you aren’t running late. Drop your kid off at the door, if possible, and then find parking. Be low key when you drop them off – I simply say, ‘be awesome!’ and give him a high five. Don’t hover, and let him hang out with his classmates. Minimize our own anxiety about our kid’s performance. To be truthful, nobody is looking at your kid. They are only watching their own child on stage. And so what if your kid lies down on stage, or doesn’t follow the dance moves? I guarantee there are other kids doing the same thing (you just don’t notice them). Take pictures or video so you can show him afterwards. Use photos/video to prep for the Christmas concert next year, to remind him what it is all about. Afterwards, emphasize your child’s strengths and what they did well. Was he able to be on stage during his part of the concert? Emphasize that, not the fact he was sitting on the bleachers instead of standing. This is a time for celebration, not for perfection. Planning for success is all about perspective: it is a kids’ Christmas concert, not a Broadway show. I need to take my own advice: most of all, relax and enjoy: your kid is awesome just the way they are.